In preparation for the upcoming Negroni Week (June 5-11, 2017) I decided to create a few Negroni variations with some of the gin in my liquor cabinet and see how the drink changed. The classic negroni is equal parts gin, sweet vermouth and Campari. For my variations I used Alessio Vermouth di Torino Rosso, Campari and three different gins. Negroni #1: This was made using Bombay London Dry Gin (43% ABV) which is a classic gin vapor distilled with Juniper, Coriander, Liquorice Root, Almonds, Lemon Peel, Cassia Bark, Orris Root, and Angelica. As a negroni, sweet and bitter notes were well balanced but the gin got lost under the vermouth. It had lots of herbal complexity from the wormwood and citrus, with a nice juniper finish. Negroni #2: This was made using St. George Spirits Botanivore Gin (45% ABV) which is a contemporary gin with juniper, bay laurel and fresh cilantro in a vapor basket and angelica, bergamot peel, black peppercorn, caraway, cardamom, cinnamon, citra hops, coriander, dill seed, fennel seed, ginger, lemon peel, lime peel, orris root, Seville orange peel, and star anise macerated in the pot. As a negroni it had a strong citrus aroma on the nose, sweetness from vermouth was still very strong however the finish had a slight spicy character from the gin. Made with equal parts the negroni was slightly out of balance however, adding a touch more gin does the trick. Negroni #3: This was made using The Spirits Guild Astral Pacific Gin (43% ABV) which is a contemporary gin pot distilled with Juniper, coriander, angelica, cinnamon, grapefruit peel, clementine peel, orange tree leaves, pink peppercorn, pistachio, sage, and orris root in a neutral brandy made from clementines. As a negroni bright floral notes came through on the nose with a light fruity aroma almost like bubble gum. The flavors were well balanced between sweet and bitter with juniper and citrus coming through clear on the finish. California Agricole Rum (2013), distilled by St. George Spirits and bottled at 43% ABV. St. George Spirits was founded by Jörg Rupfin in 1982 and he spent his first decade producing some of the best fruit eau de vies in the US. In 1996 Lance Winters began working at the distillery and helped develop their single malt whiskey and a variety of other spirits. In 2010, St. George distilled and bottled their first batch of California Agricole Rum (initially labeled as Agua Libre) from sugar cane grown in California's Imperial Valley. Like the agricole rums produced in the French Caribbean, St. George California Agricole Rum's exhibit a very funky profile that can change year-to-year based on the terrior of the sugar cane. Nose: Very strong notes of decomposing vegetable matter. Palate: Medium body and soft on the tongue. Tastes sweet with a note of butter up front, Mid-palate it displays a mineral character with the flavor of cooked broccoli that ends with a light hint of pepper. Finish: Long finish with a slight smokey note and a hint of caramel. Conclusion: St. George's 2013 California Agricole Rum is true to its style. It has all of the strong aromas and flavors commonly found in rums distilled from fresh-pressed sugar cane juice. However, I am just not that crazy about it. For those who enjoy other agricole rums, St. George's is probably worth buying, but for me I am still more intrigued by the idea more than the result. On Wednesday November 13, a couple hundred of people filled the historic Banking Hall at 400 California street in support of the Women's Initiative for Self Employment. People happily mixed and mingled as they sampled wine and whiskey from a number of sponsors. Four Roses, Mitcher's and Compasbox all poured from their extensive whiskey lines. St. George poured their Breaking & Entering Bourbon, Dry Rye Gin and Absinthe. 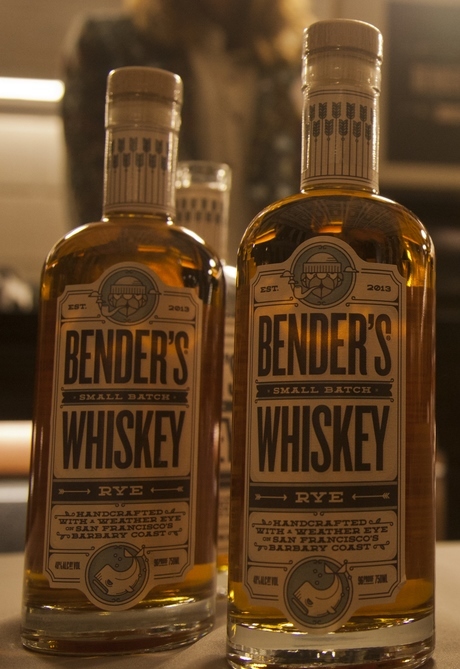 Bender's Whiskey Company, based on Treasure Island was pouring samples of their Bender's Rye whiskey. The event bar was expertly staffed by Romina, the General Manager of Nihon Whisky Lounge, and featured a number of classic whiskey cocktail. I tried their version of a Sazerac, made with Bender's Rye Whiskey and St. George's Absinthe, which mixed together very nicely. The main program for the evening was emceed by San Francisco's District Attorney George Gascón, and his wife Fabiola Kramsky. The highlight of the evening was a talk by Atrid Lopez, a Women's Initiative graduate and owner of Elite Sports. She shared how the training she received from the Women's Initiative helped her and her family start and successfully run their business since 1989. After Astrid spoke, her son, Ivan Lopez shared about how through his family's success he now owns and operates Artillery Apparel Gallery, a hybrid art gallery/retail space that features art and clothing from local designers and artists. The Lopez family is a great example of how empowering women to become small business owners not only helps them and their family but also ripples outward to the surrounding community. The event was able to raise over $40,000 which will go towards funding the next cohort of women who sign up to take their training on how to successfully run a small business. I for one was happy to participate in the event and was glad to see local wine and spirit produces supporting the next wave of small business owner. On November 13, 2013 the Women’s Initiative for Self Employment will be holding an event called “Wine, Whiskey and Wicked ROI: Microfinance the Works.” The event will feature tastings from a variety of wineries and whiskey distilleries as well as a silent auction. The proceeds from the silent auction will help support their work, “assisting high-potential low-income women who dream of business ownership.” I found out about the event through a relative who works for the Women's Initiative at their San Francisco office. Since 1988, the Women's Initiative has helped to create over 5000 jobs and returned $30 to the local economy for each $1 invested in their program. The event will be held in the historic Banking Hall at Union Bank (400 California St.) in San Francisco's Financial District. Four wineries will be pouring a selection of their wines: Nobel Grape Wines, an importer or Italian and Israeli wines; HKG Estate Wines based in the Russian River Valley; Andis Wines out of Amador County; and Cornerstone Cellars who make wine from grapes grown in Napa Valley and Oregon's Willamette Valley. On the whiskey side of things the Women's Initiative was able to get three distilleries and four blenders/bottlers to pour some of their products. They include Alameda's own St. George Spirits, maker of their own Single Malt Whiskey as well as Breaking & Entering, a blend of Kentucky Bourbons. Old World Spirits, they distill Goldrun Rye Whiskey among other great spirits in Belmont, CA. Four Roses Bourbon, distilled in Lawrenceburg, KY. Bender's Whiskey Company, located on Treasure Island, they are blending and bottling some tasty 7 year old rye whiskey sourced from Alberta. Michter's Whiskey, they source and bottle a number of good whiskies distilled in the US. Compass Box Whisky Company, one of the finest Scotch blenders in the UK, they make a range of excellent blended malt, blended Scotch, and blended grain whiskies. And finally, Pür Spirits, a San Francisco based importer of German beer schnapps, liquors and vodka. The Women's Initiative is a not-for-profit so I believe the ticket s for the event are tax deductible as well as donations made through the silent auction or directly to the organization. I am looking forward to trying some new wines and great whiskeys while supporting a an organization with a important mission. See you there!